With one FAA approved jetpack to its credit, JetPack Aviation unveiled a prototype of its next model on Wednesday at CES 2018 in Las Vegas ... the JB-11. The new model has six turbojet engines, and the company says it can fly about 20 miles at speeds up to 150 mph (about 130 knots). The U.K. newspaper The Daily Mail reports that, according to company co-founder and CEO David Mayman, the company has been working on achieving the dream of every kid in the 60s to have a jetpack for about 10 years. 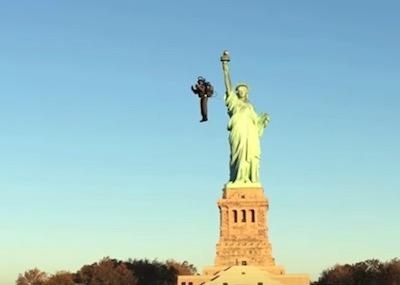 The first model was revealed when Mayman flew around the Statue of Liberty in November, 2015. He made a similar flight in the JB10 model over the River Thames in London in 2016. At that time, he announced that the JB-10 was available for sale to "well qualified buyers". The company says the JB-10 model has applications for entertainment opportunities, such as promotional flights, pilot training, STEM education, a "JetPack Top Gun Experience Center" where anyone can feel the thrill of personal flight, even a racing league. In April 2016, JPA entered into a Cooperative Research and Development Agreement (CRADA) with the United States Special Operations Command (USSOCOM). By achieving the challenging goals under this agreement, we’ve proven that a small, powerful turbine powered vehicle can efficiently, dependably, and safely meet rigorous operational demands of our nation’s most elite Special Operations Forces (SOF) and industry partners. The larger JB-11 model with its six engines will likely be marketed more to the military rather than civilian sector for ultra-fast transport, Mayman told the paper.